Whether it’s skiing in Switzerland, eating tapas in Barcelona, or taking a road trip to the next state, we all know that the best vacations are the ones that leave us with the fondest memories To help you preserve all your favorite moments and mementos, we’ve compiled our favorite things to capture (and display!) your favorite keepsakes and photos. This 10-inch digital frame is the perfect way to display all of your vacation photos, not just one or two. Buy it now. Looking for an effortless way to preserve your favorite vacation moments? Consider this memory jar, which allows you to stash small items without spending time on a scrapbook. Buy it now. Think of this small-but-mighty diary as your own personal travel organizer. It easily holds plane tickets, concert stubs, hotel key cards, receipts, and more — so you don’t have to worry about losing any of them. Buy it now. You no longer have to sacrifice your iPhone battery to capture great memories. Whether you’re snorkeling in the South Pacific or ziplining in Costa Rica, this compact and waterproof digital camera — which takes photos and videos — is easy to use and will always have you (and your social media feed) covered. Buy it now. This fun book is great for both travel newbies and frequent flyers. It covers more than 70 topics (think food, people, animals, countries) and is ideal for capturing all of the small details you may have otherwise forgotten. Buy it now. This scratch-off map may be the most satisfying way to cross destinations off your bucket list. Each destination you scratch off reveals a sliver of stunning watercolor, and it serves as a great source of inspiration for planning your next adventure. Buy it now. Keep your vacation photos stowed away and organized with this sleek album. While we’re huge fans of its sturdy design and chic aesthetic, we also love how functional it is: the album holds up to 106 4x6 photos or 80 5x7 photos. Buy it now. If you’re looking for a fun way to show off your pictures, consider this wooden photo frame, which includes adjustable twine and 30 clips. When you want to hang up new photos, simply swap out the old ones for a fuss-free display. Buy it now. This journal encourages travelers to think outside of the box in order to capture every detail of their adventure — no matter how trivial it may seem at the time. After all, it’s the little moments that make traveling so special. Buy it now. 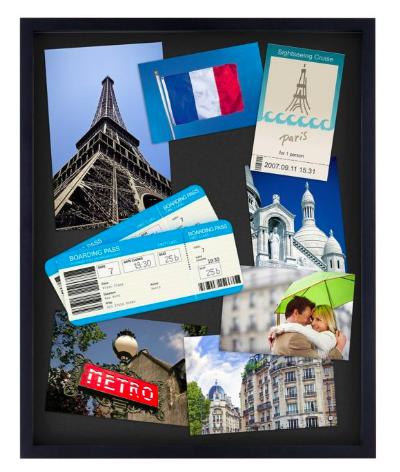 Use this frame as a blank canvas to display your favorite mementos from your travels. What’s more, the box is large enough to fit multiple images along with small souvenirs, so you can proudly display them on your wall for all to see. Buy it now. ShermansTravel uses affiliate links in this article to generate revenue. When you purchase an item after following one of these links, ShermansTravel may receive a commission. The items in this article were chosen independently by ShermansTravel’s editorial team.